The use of technology to preserve life after death—or completely eliminate the very concept of death—has been a recurring theme in science fiction. Clones, androids or even a kind of virtual resort where the consciousnesses of deceased individuals can be uploaded, as the Black Mirror series proposes, are some of the solutions imagined in those narratives. Although in reality we are still far from this utopia, some developers and research centres already use artificial intelligence (AI) to collect biographical data and the digital trace of an individual and, in this way, create “consciousness software”. This is what data scientist Muhammad Ahmad of the University of Washington did when his father died. Concerned with the idea that his future children would not be able to meet their grandfather, Ahmad developed a chatbot that simulates his father. The chatbot learns from the transcripts of conversations between Ahmad and his father, and tries to build predictions about how he would have answered various questions. At the moment, the bot is limited to text communication in the form of questions and answers, but the scientist already has plans for the future. “The eventual goal is that you start with text, and a few years later it graduates to voice synthesis, and then maybe eventually one can even have a system in virtual reality that one can interact with,” he explains. Software developer Eugenia Kuyda did something similar after losing a friend in a car accident. Kuyda compiled messages that Roman Mazurenko had sent to her and to other friends and family, gathering more than 8,000 lines of text that captured the interests, thoughts and personality of Mazurenko. This was the raw material necessary to train a neural network to speak like the deceased friend, responding to the messages as if he himself were writing each word. The developer admits that the technology was not perfect and that @Roman sometimes answered questions in a disconnected way. “But in the near future we can do much more,” she argues. In fact, Kuyda launched Replika in 2017, an application that allows users to talk to an AI system. This system learns the user’s opinion on different topics and feeds them through a neural network to absorb their tone and approach to varied situations, thereby creating an appearance of their personality. As with the Roman bot, here the result is also a shadow of the user. Attempts like those of Ahmad and Kuyda can be improved with recent advances in voice technology. Google, for example, launched Duplex last year, an “AI system to perform real-world tasks over the phone.” The system uses Google’s automatic voice recognition technology with a neural network to make business calls personifying the users. Duplex is so sophisticated that it has a series of words and expressions like “humm” or “ah”, which imitate the pauses and intonations of natural speech. In fact, when the company introduced the technology, there were complaints that Duplex deceived people, making them believe they were talking to another human being. Thanks to advances like this, some developers already dream of a future in which AI ​​will learn to appropriate the vocal rhythms and tics of the personality of specific individuals. In a way, voice technology is already being used to digitally resuscitate some people. 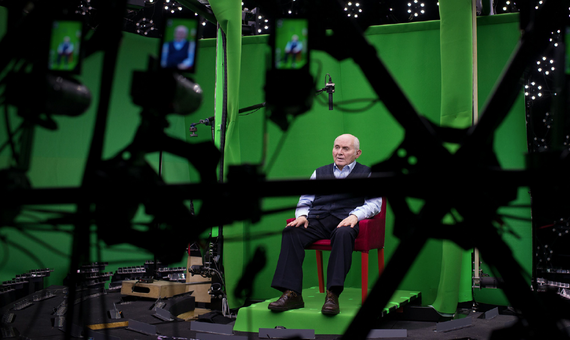 A collaboration between the Institute of Creative Technologies at the University of Southern California and the Shoah Foundation has resulted in the New Dimensions in Testimony project, which created about a dozen interactive biographies of Holocaust survivors, based on extensive interviews filmed on a set with 360-degree cameras. The testimony of each of these individuals is used to create a digital projection that, thanks to natural language technology, can answer questions from the public. For example, if someone asks a survivor how he or she managed to escape from the Nazis, the system detects the question and projects a relevant section of the interview. When editing these fragments together, the intention is to give the impression of a perfect conversation with a witness to the story. “Years from now, long after the last survivor has left us, Dimensions in Testimony will be able to provide a valuable opportunity to engage with a survivor and ask them questions directly,” explains a spokesperson for the Shoah Foundation.